5 Bedroom Detached House For Sale in Penzance for Offers in excess of £530,000. 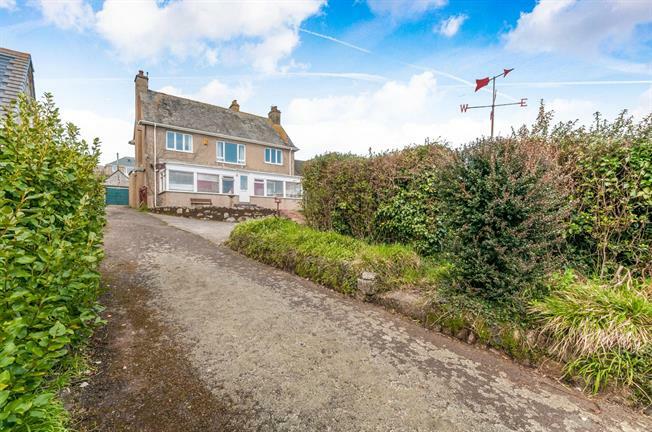 Impressive detached property with expansive sea views. Sitting on a large plot ideal for development or a refurbishment project. The ideal holiday property. Walking distance to the beach and town centre. First arriving at the property the front garden gives you a sense of the size of the plot. Steps lead up to the conservatory veranda which faces directly to the sea offering superb panoramic sea views. This is a perfect place to sit in all weathers and relax. Steeping into the main property takes you to a large dining room with double doors through to a spacious sitting room with a fire place perfect to relax in the evenings. To the opposite side of the dining room a large fitted kitchen/breakfast room with sliding doors to the conservatory. From the kitchen a rear lobby leads to an ample utility room and separate WC. Staying on the ground floor a rear hallway has the turning staircase to the first floor and also the fifth bedroom or study. Arriving on the first floor a spacious landing leads to the four double bedrooms. The bright double aspect master bedroom and two further double bedrooms all have superb sea views to the front. There is a family bathroom and a separate wc, while the fourth double bedroom lies to the rear of the property. The larger portion of the garden is to the front of the property, with a spacious lawn area ideal for children or pets. There is a variety or shrubs and flowerbeds. The long driveway to the side leads to a parking/turning area and to the double garage at the rear, with potential to create an annex subject to planning consent. To the side of the garage is a raised paved patio area perfect for Barbecues. In addition to the garage are three sheds ideal for storing surfboards, bikes or garden furniture. The property has mains water, electricity and gas. Penzance is one of Cornwall's most famous and vibrant larger coastal towns and an extremely popular tourist destination. The town centre offers a wealth of shops, cafes, hotels, restaurants and night life, plus a variety of historic architecture with attractions such as the refurbished Jubilee Pool, the art deco lido and stunning subtropical gardens of Morrab and Penlee. The promenade stretches alongside the popular sandy beach with walks to St Michael's Mount at Marozion and Newlyn harbour in the opposite direction popular with artists and art galleries. There are good junior and senior schools plus bus stops with a regular service. Main line train station to London is also a big advantage. The City of Truro is approx 25 miles, Newquay Airport is 40 miles distant and the Scillonian leaves from Penzance to the Scilly Isles most days throughout the summer. A short drive will also take you to Lands End, Sennen Cove for surfing or a little further to the fishing town of St Ives.